AAEM Resident and Student Association : Why is My Arm Swollen? A 16-year-old female presented to a children's hospital emergency department with two weeks of intermittent left shoulder pain. Over the last few days, her left arm had become diffusely swollen and painful with mottling of the skin, coolness of her left hand and paresthesias on the lateral forearm. 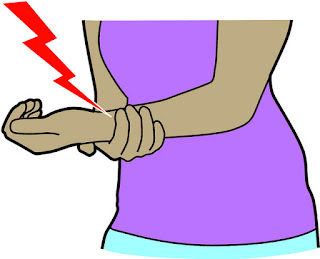 Exam revealed strong radial and brachial pulses with her arm dependent, and decreased pulses when she raised her arm. She was a competitive swimmer and practiced up to four hours per day and symptoms were worse after exercise. Thoracic outlet syndrome (TOS) is an uncommon condition with varying presentations and a constellation of signs and symptoms that make diagnosis very tricky. It is characterized by compression of the neurovascular bundle exiting the thoracic outlet, involving the subclavian artery, vein and Brachial plexus. Historically, it was categorized by the anatomic abnormality causing the compression, such as cervical or first rib, scalene muscle hypertrophy, costoclavicular and hyperabduction syndrome. Symptoms can be a combination of neurologic, vascular or pain. The classic patient described in literature is a young athlete, more often female and about 95% neurologic. If blood supply is affected, patients can develop muscle atrophy, decreased pulses and other symptoms of arterial occlusion, including necrosis. Venous congestion can present with venous thrombosis and is more common in young men. Stretching of the brachial plexus can result in sensory and motor deficits in a single nerve distribution, usually ulnar. There is no specific diagnostic test for thoracic outlet syndrome and patients usually end up having extensive workups, depending on their presentations. Although there are many specialized physical examination tests, only one can reliably pick up abnormalities in all three systems. The elevated arm stress test (EAST) is conducted by having the patient sit with both arms abducted to 90 degrees and elbows flexed at 90 degrees. The patient then opens and closes both fists for three minutes. Patients with neurovascular compression will not be able to complete the task and will reproduce their symptoms. Imaging and other diagnostic testing can be utilized to evaluate for arterial or venous occlusion and all patients should receive chest and cervical spine films. Patients with suspected thoracic outlet syndrome and no acute arterial occlusion or venous thrombosis should be referred to physical therapy, a general surgeon and other appropriate specialties depending on their site of compression. More serious presentations should be admitted for management of their complications. Suspect thoracic outlet syndrome in patients with shoulder or neck pain and neurovascular symptoms. Cervical rib is bilateral in 70% of patients and can be seen on chest X-ray. The EAST exam may be useful in identifying patients with possible TOS and intermittent symptoms.